If you’re a must-have-diesel guy, or love-the-luxuries girl, start with our 2013 Chevy 3500 truck choices, and then ask your preferred truck dealer (Ford, GM, or RAM) to help you add your desired features without going under 3,800 pounds of payload needed for a wet and loaded 8-11 EX. With today’s trucks achieving higher and higher payloads, it might very well be possible. Just don’t be surprised if the package with the air conditioned seats puts you over. Truck options are heavy. There has been quite a buzz around the Northern Lite 8-11 EX since it debuted in Truck Camper Magazine and started arriving on dealer lots. The great majority of this attention is focused on the new dry bath, a design that challenges the very definition and accepted aesthetic of a dry bath. Due to this focus, the decision for many about the 8-11 EX will be based entirely on their reaction to this dry bath design. Here’s how I see it: the 8-11 EX bathroom – as a reader suggested – is a dry toilet bathroom. Not having to dry the toilet and toilet floor is a huge benefit. The need to dry the shower stall and sink is half the work of drying an entire wet bath. The all-new 8-11 EX dry bath design saves considerable time and effort compared to a wet bath, and leaves the toilet and toilet floor area dry. From this perspective, the new dry bath is a nice upgrade. What’s really missing with the 8-11 EX is the dry bath aesthetic, and storage. Folks expect to see a finished floor in a dry bath, along with wood cabinetry and counter top space. The 8-11 EX dry bath offers none of these features or visual cues, and looks – for all the world – like a wet bath. The rest of the 2018 Northern Lite 8-11 EX is simply stunning. 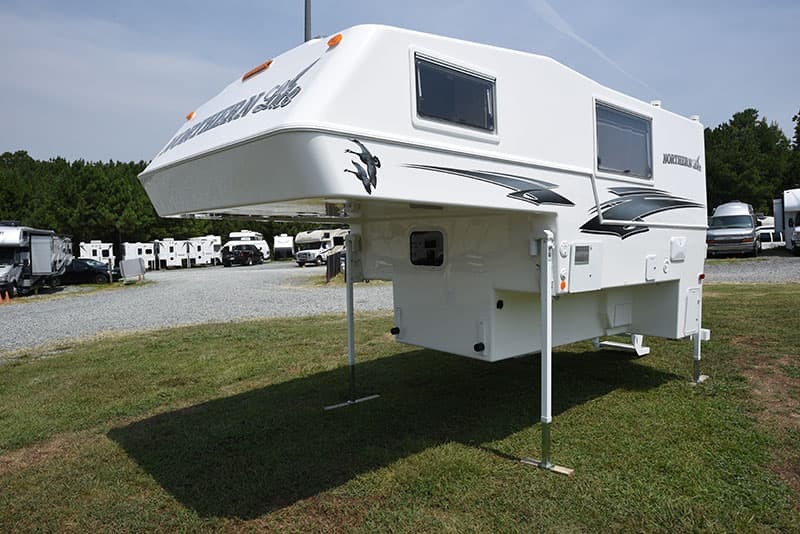 The dual clamshell fiberglass construction is second to none in the entire RV marketplace for quality, durability, and longevity. The floor plan, materials, build, and overall interior finish is as refined as anything in a luxury car. This is RV industry-leading quality folks, pure and simple. 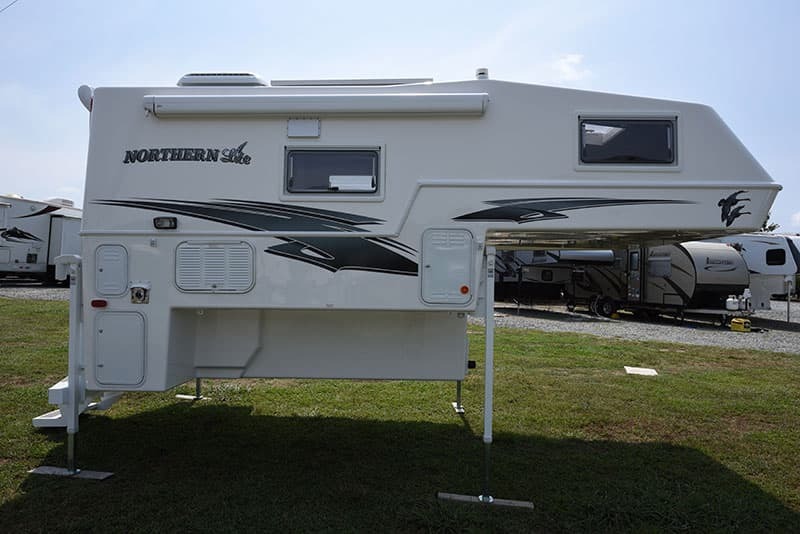 Ask Northern Lite owners about their campers. They’ll tell you. If you’re in the market for a non-slide short bed truck camper, the 8-11 EX or the wet bath 8-11 should absolutely be on your short list. Match a Northern Lite 8-11 EX with a truck like our previous 2013 Chevy Silverado 3500 short bed (or similarly specified Ford or RAM) and you will have one heck of an awesome luxury truck camping rig. Truck Camper Magazine inspects all reviewed truck campers for design, material, and quality issues and reports what we find. However, since Truck Camper Magazine reviews only brand new truck campers, our reviews do not address long-term quality, customer service, or reliability. To learn about a brand’s long-term quality, customer service, and reliability, Truck Camper Magazine recommends talking directly with truck camper owners at truck camper rallies and online via truck camper forums and truck camper owners groups. Please be sure to balance your gathered feedback across multiple sources including direct correspondence with the truck camper manufacturers and your closest truck camper dealers. Click here if you are new to truck campers.